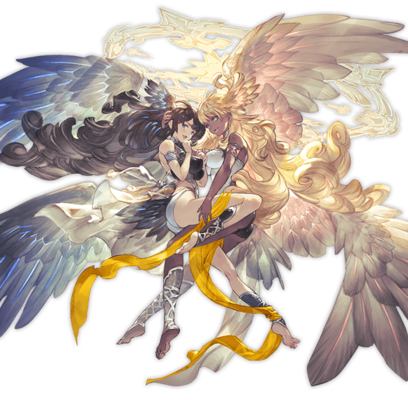 The twin primarchs of instruction, these two sisters are counted among the very first primals. Although they chiefly act as messengers among the primarchs, at times they also offer mortals their guidance. Their duties make them privy to many of the world's secrets, but the Astrals designed them to lack interest, as well as a certain amount of intelligence. Local status effect on all foes. 3T3 turn cooldown. 20% more damage (Damage cap: 10,000 per damage instanceEvery time damage is applied including every hit of a double or triple attack, every hit of a multihit skill, and every time bonus damage is inflicted.). 1% of its Max HP as damage every turn (Damage cap: 100,000). See Supplemental Damage for more information. This page was last modified on 6 April 2019, at 16:59.